Just spent the last 2 weeks slaving over nine, rather complicated, Shakespearean costumes. Loved it…but I almost went insane. As did my puppy, who was abandoned outside the whole time because I simply could not sew and watch his every move at the same time (he’s a chewer). But don’t you worry, he was able to find ample entertainment. Our drip system will have to be replaced and a few plants have now been replanted about 10 times each. Not sure my husband is happy that I sacrificed the back yard :), but hopefully he’ll forgive the dog…and me. First make the graham cracker crust. Put 10 of the graham cracker and sugar in the bowl of a food processor and pulse until you have fine crumbs. Add butter and mix until combined. Press into the bottom of a 9×12 pan and bake at 350 for 9-10 minutes until lightly golden. Remove from over and let cool for 10 minutes. Pour on the brownie batter and cook for another 20-25 minutes until almost set. 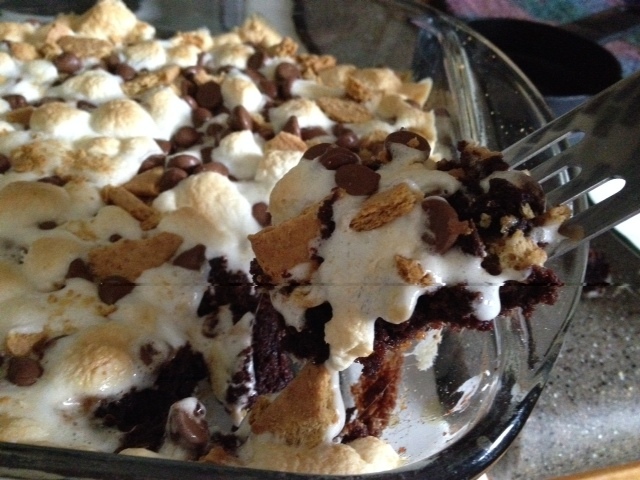 While baking, crush the remaining graham crackers by hand and combine with marshmallows and chocolate chips. 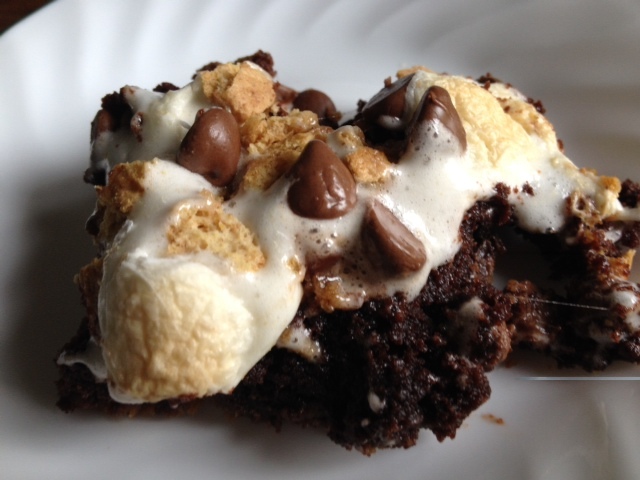 Scatter mix over the brownies and cook for 5-8 minutes until marshmallows are melted and slightly toasted.